This walk: 2012-1-25. Roughtor Plantation, Leather Tor, Middleworth Farm, Snappers Tor, bearded lichen, bracket fungus, Down Tor, Sheep's Tor, Deancombe Farm, staddle stones, Narrator brook, mortar stones, blowing house, adit, Combeshead Tor, Cuckoo Rock, Outholme cist, mine shaft, Rough Tor. View to Leather Tor, (SX 563 700, elevation 380 metres or 1246 feet). A tree that caught my eye. Approaching Middleworth Farm ..... the earliest reference to this farm is from 1281 under the name of Middelesworthi. The farmer may have been involved in tinning because in 1303 Ricardus De Middleworthi coined tin at Ashburton, a stannary town. The last tenant was Arthur Williams who stayed here until 1914 when Plymouth Corporation took it over - remember, the reservoir was opened in 1898. It was then used along with Deancombe land for growing potatoes during 1914-1918. Source: Paul Rendell (2007), Exploring Around Burrator - A Dartmoor Reservoir, The Dartmoor Company, Okehampton, page 24. This stone dates from a refurbishment in 1886 by the landlord Massey Lopes: the stone reads ML (above) and 1886 (below). Another view of Snappers Tor. Bearded lichen just up the track from Middleworth Farm. Another case of saplings growing on a stump ..... behind are trees in Roughtor Plantation. There are 700 cares of trees around Burrator, planting started in 1921, after WWI when British timber was exhausted and ships to import it were scarce after the war at sea. Afforestation started in the old farm fields and later in the newtakes above them. Source: Crispin Gill (1970), Dartmoor - A New Study, David & Charles, page 270. A bracket fungus in close-up, with a porous undersurface instead of the gills of the Basidiomycete mushrooms etc. A backlit view along the path. Zoomed view to the top of Sheep's Tor, SX 566 682, elevation 369 metres (1210 feet), just visible over the trees of Roughtor Plantation. A tree growing on what is probably an archaeological mound? Looking back at a small building beside the track. Some impressive trees - I should have identified them. In amongst the ruins ..... the first mention of Deancombe comes from 1450 when 248 lbs of tin were coined by John Shullabere of Dencomb at Plympton, the local stannary town. The last tenant was George Hamlyn who worked here until around 1910. Source: Paul Rendell (2007), Exploring Around Burrator - A Dartmoor Reservoir, The Dartmoor Company, Okehampton, pages 15-16. Staddle stones in the ruins of a nearby building - these held the floor up off the ground and had rat-thwarting circular or mushroom-shaped stones on them where rats couldn't grip the under-surface. A fairly new gutter and bridge down the track from Deancombe Farm. An old mortar stone, used under the crushing "stamps" that pounded tin ore to a powder. The old blowing house at SX 57972 68603, just off Narrator Brook - not a lot to see and overgrown with bracken in the summer, although there is a near-hidden moss-covered double mortar stone to be found. Bracket fungus on the blowing house wall. Looking into the adit, there was a small rivulet of water running from the mine workings nearby. Zoomed view to Cuckoo Rock (SX 5847 6872) ..... once featured in Rock & Gem magazine? Or was it Boulder Weekly? Outholme cist at SX 57997 68283, with Sheep's Tor behind. Outholme cist: details: J. Butler Dartmoor Atlas of Antiquities III (1994) 47.10, fig. 47.7 (page 70). Outholme cist with Combeshead Tor behind. Cuckoo Rock is discernible as the side-lit conical stone above the left stone of the cist. The walled mine shaft at the corner of Roughtor Plantation at SX 5776 6831. A scene showing the long shadows of the pine trees in Roughtor Plantation at mid-morning in January. "On the highest ground within Roughtor Plantation is the rock-pile from which the wood takes its name, Rough Tor (approx. 1,000 feet). This small but rugged tor ..................................... The summit rock has a well-formed basin, sixteen inches in diameter, five inches in depth, and with a distinct lip; two smaller basins in a lower rock show by their angle that the rock has tilted." The location of the feature we found is SX 57430 68557 ± 6 metres (subject to improved GPS location). Its elevation is about 303 metres (1007 feet), from the Ordnance Survey map, although we omitted to record a GPS elevation at the tor - however, a GPS error of ± 6 metres in elevation is probably best omitted! The record of The Great Finding of Rough Tor can be seen here: 18 Nov. 2011. Hugh conquers the long-lost Rough Tor! Photograph taken to show South West Lakes Trust the size of the tree that they might take down so as to expose the tor again. The white square is a piece of kitchen roll as a scale! Leather Tor, (SX 563 700, elevation 380 metres or 1246 feet) with Sharpitor (SX 560 703, elevation 410 metres or 1345 feet) behind and left. A strange sheep-creep set-up? Seen in the wall near SX 5680 68733. Narrator brook where it goes under the road around Burrator Reservoir. 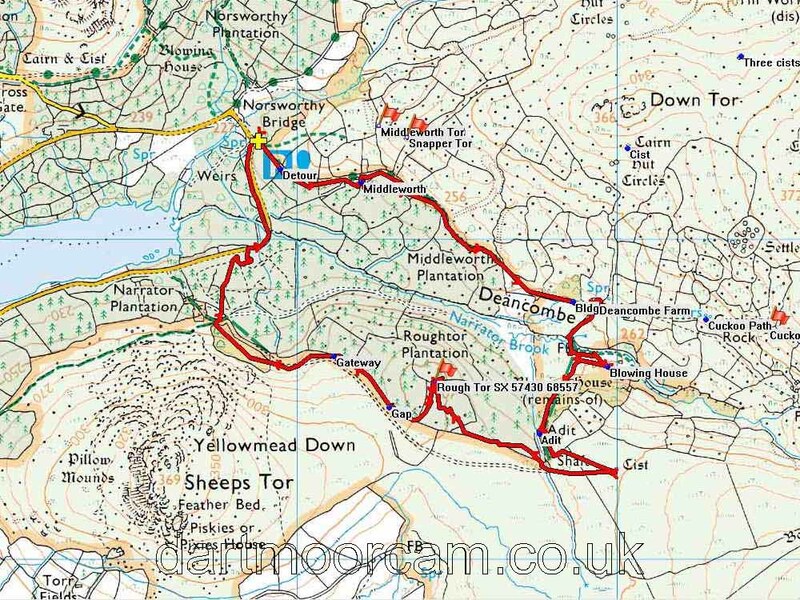 This walk was reached by driving to Dousland, turning at the Burrator Inn crossroads towards Meavy, then left to Burrator Reservoir, continuing past the dam and around the top end of the reservoir, over the small bridge (Norsworthy Bridge) and parking in that area, indicated on the map by the P symbol and the yellow cross.